We’re always working to make using Healthquest as easy as possible, and in the latest version, we’ve added a new feature to do just that: Program Setup Search. Entering a term into the search bar will bring up a list of all the settings that match that term. 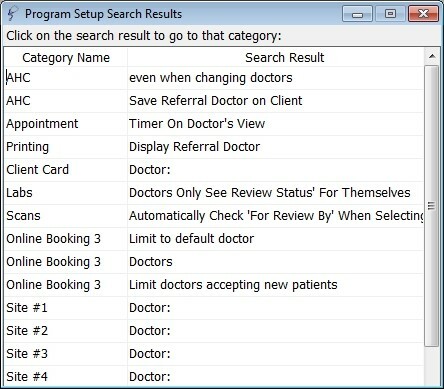 For example, searching for ‘doctor’ will list all the settings within the Program Setup that match that term. Clicking on a result will bring up and highlight that setting in the Program Setup window.